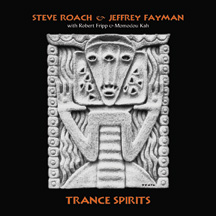 Trance Spirits by Steve Roach, Jeffrey Fayman, Robert Fripp and Momodou Kah represents the next step in genuine tribal ambient soundscapes. This amazing gathering of artists makes a magnificent leap into the future of acoustically-fused electronic music. Five of the seven pieces are driven by a complex juggernaut of authentic African percussion, performed as long-form groove trance pieces by Fayman and Kah. As opposed to just using loops to conjure the desired mood, Trance Spirits is a real continuum of time, with subtle evolution within the tracks. Entwined with the shamanic / harmonic trance-inducing soundworlds created by Roach – and augmented by Fripp on three tracks – the combined effect unleashes the primal forces of nature with a boiling undercurrent of rich, transporting textures. This item is out of print, and here for historical reasons.